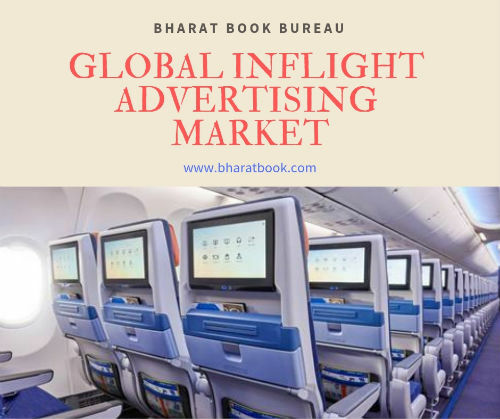 Bharat Book Bureau Provides the Market Research Report on "Global Inflight Advertising Market Information Report by Product (Inflight magazines, Display Systems, Baggage Tags, In-Flight Apps, and Others (Overhead Bins, Seatback Tray Tables, Boarding Passes, and Aircraft Wrap )), by Aircraft Type (Business Aircraft and Passenger Aircraft) and by Regions (North America, Europe, Asia Pacific, Middle East and Africa, and South America) - Global Forecast To 2023 " under Media & Technology category. The report offers a collection of superior market research, market analysis, competitive intelligence and industry reports. In-flight advertising incorporates the mode of advertising through the overhead storage bins, setback tray tables, in-flight magazines, and sales pitches. The Global In-Flight Advertising Markethas witnessed a transformation with the advent of digital media. Individualized computing and individual smartphones empower the advertisers to convey ads to people / travelers with unique publicizing content directly to their own devices, which is relatively significant as compared to the conventional techniques for the in-flight advertising. The digital in-flight is creative with the addition of dimensions of interaction to the sound, sight, and motion. The growing demand for the customization of the aircrafts is boosting the growth of the global in-flight advertising market. The global in-flight advertising market is expected to grow at CAGR of 11.17% during the forecast period (2017-2023). Geographically, the global in-flight advertising market is divided into global regions like Europe, North America, Asia-Pacific, Middle East, LATAM, and Africa.